When we started Hubstaff, being a remote company was simply the obvious choice, and getting an office was never even a consideration. We understood the software that we wanted to create and the type of team we envisioned. My technical co-founder, Jared, and I began working from home, so Hubstaff started off remote from the very beginning. Once we were ready to bring on another team member to get a minimum viable product, it was an intuitive step for us to work with freelancers and people from all over the world. Remote work is what we believe in. One of our core values is to be able to live and work wherever we want, and to have worldwide access to international talent. 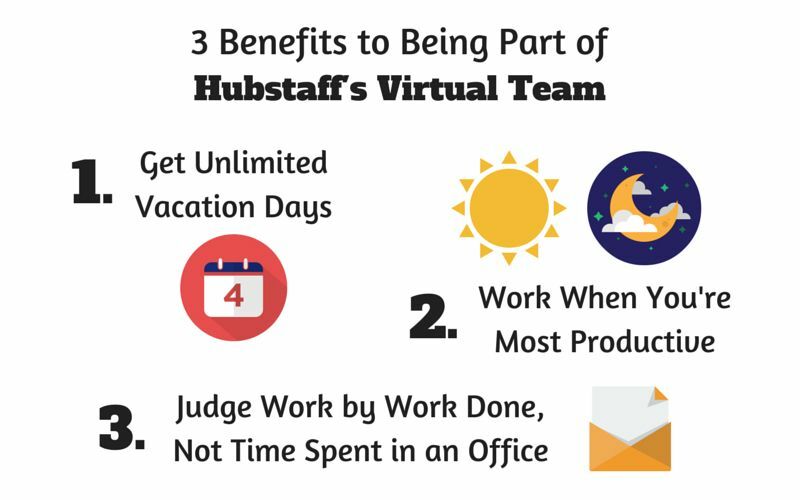 Working virtually is in Hubstaff’s DNA, and it’s what our software is all about. We use our own tools, designed to help remote teams work more efficiently, to help our team excel. In this post I’m going to write about what our team looks like and what we’ve learned managing a remote team. This includes the benefits, the challenges, where our team stands today and how we operate. Geographically, we have team members from Florida, California, Indiana, Illinois (all in the US), Ukraine, Serbia, Romania, the Philippines, Turkey, Bulgaria, and India. Across our development, marketing, and support teams we cover dozens of timezones. The most important aspect is that all of our team members have personalities that fit into our company culture and core values. The Hubstaff team is caring, considerate, responsive, communicative and accountable. They are all highly skilled professionals who are key players for the business. The work we get from remote talent is comparable to what we would get working with local employees in an office, and potentially better. Our team is smart, can think for themselves, innovative and well educated. We value the people that we work with and pay them well. Sometimes outsourcing gets a bad reputation because the people hired are not “thinkers,” they simply follow orders without giving any input or trying to understand the strategy behind the tasks. This is common when you go for the lower hourly prices, sometimes because these freelancers are just starting out or they simply don’t care. We don’t have to deal with that at Hubstaff because what we do at Hubstaff is not “outsourcing”. We personally invest time to find the right team member and then work with that person usually for several years. It’s very rare that a person leaves or we have to fire a person after working together for 60 days. We stay off their backs, we allow them the freedom of getting their jobs done the way they choose, they can work any time they want during the day (or night), and they can work wherever they want in the world. Moreover, they don’t have to put in a full day if they don’t want, they can take off any day they choose. That freedom goes a long way in managing virtual teams and for team member happiness. We don’t go for affordable work, we go for high-quality talent. Eventually, new team members become an integral part of the team and an important part of our lives after working with them for hours every day. Over time we learn how many kids they have, what their hobbies are, and what they are passionate about. The video below demonstrates how one of our developers from the Ukraine communicates with us. This developer has been doing Ruby on Rails for seven years, he’s college educated and can think for himself (as you’ll see in the video). The video will show that there is sometimes a slight language barrier, which isn’t always ideal, but it has never caused any major issues. The only challenge that we might run into hiring someone from a country where English is not the native language is when it comes to writing articles, marketing and public speaking requirements. However, the primary thing we’ve noticed with our carefully selected talent is that they are hard working, smart, caring and responsive. Our team can use video chat, videos such as the one above, and text to communicate with us. Here are a few collaboration tools we use that are great for managing virtual teams. We use Skype for instant messaging and meetings. It’s great because we can also create groups in Skype, allowing us to talk to different departments. For example, we have a Hubstaff marketing chat that we can send any news coverage or interesting marketing articles to. The only thing that I don’t personally like about Skype is that it’s easy to be distracted. Jing is great for tutorials and when you’re trying to demonstrate an idea. The above video of the developer was recorded using Jing. When we bring someone on-board and want to explain some of our processes, we simply capture a short video of our screens to show the exact steps. Jing is also great for capturing screens to show instead of tell. For example, if something looks off on a blog, we can capture our screen and share the link on Trello. I use Jing around 10-15 times a day and it can record videos as well as static screenshots with annotation. We use Trello for our marketing teams. Their kanban boards help us organize our projects down to actionable tasks, which we then assign to different team members. Some of the cards in our Trello could be dedicated to a specific blog post, while another could be dedicated to designing a landing page for a new eBook. We use Pivotal Tracker for our development teams. Their agile project management tools suit our development teams’ communication style, and we can prioritize which projects need attention immediately, which can wait, and how much we can expect to get done in a given sprint. We rarely use email to communicate at Hubstaff, because we’ve found it’s inefficient. Things tend to get lost in long email threads, people forget to copy someone, and important information simply drops off like socks disappearing in dryers. Instead of emails, we’ll send messages in Trello or Pivotal Tracker, where they are recorded and can be quickly referenced. If they are short, informal messages that need immediate attention, we’ll even use Skype to chat. Learn more about how we communicate with our virtual teams at the Hubstaff University. Managing virtual teams is hard, but once you find a good system it works well. 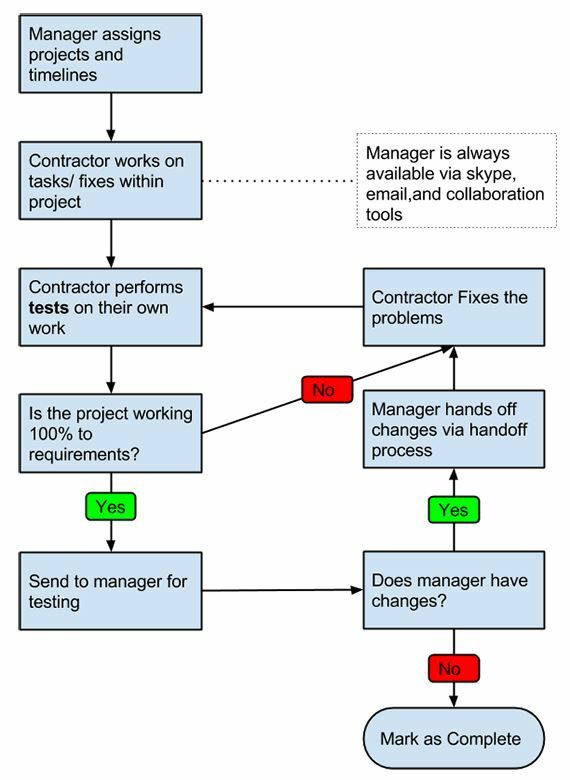 The flowchart below comes from our “No Excuses” guide to remote management and outlines the progression of a task, from assignment to completion. You can also check out our webinar on 5 Tips to Reduce Stress in Your Remote Business. We pull the curtain back in this webinar and detail what exactly we do in Hubstaff to manage our virtual teams. Essentially, we want to focus on managing the business from the highest level. Work on the company from the top down to avoid getting caught up in trivial activities and focus on the strategy and end goal. In order to do this, we use Trello to manage the projects and Hubstaff to manage our team. This is the biggest benefit of working with remote employees; we get a higher level of talent for our money. For example, when we were building our desktop clients we worked with someone who was on the Skype development team, not that Skype is without bugs :), but the point is that this person was really high level and he lived in Estonia. We also had a developer who was recently hired by Google that was from Serbia living in Thailand. We have collaborated with amazing people from all around the world, and that opportunity wouldn’t have been there if we were stuck in an office picking exclusively from the local work pool. Building a startup like that is possible if you don’t have complex development requirements, but if you are in Omaha, Nebraska, the fact is that it’s hard to get a high level C++ developer. There are two big reasons why this is true. The first reason is that some parts of the world have a much lower cost of living, and we could leverage that to our advantage. In the United States, we might have had to pay $100 – 200 an hour for a top developer, which we wouldn’t have been able to afford even though we want a top quality product (we’re bootstrapped). Startups don’t often have a lot of capital in the beginning, so saving money while getting quality work could make a big difference between success and failure. The second reason distributed teams save money is because we pay on an hourly basis. 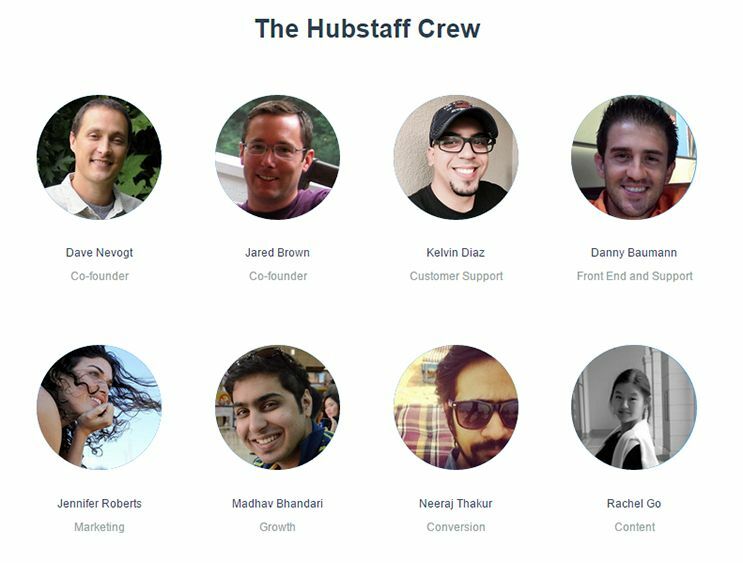 Hubstaff team members are paid hourly, and that gave us the ability to work with great developers without having to hire them full time (assuming we could even convince them to accept a full time role with us). If we hired a full-time developer it might cost us $7,000/month in salary, whereas hiring a part-time developer of the same caliber might only cost $1,500/month in hourly wages (the worker obviously just spends far less time on our project). Hourly work also gives startups another advantage; you only pay for the work that is actually done. If you don’t have work for a contractor at any specific point in time, you’re not on the hook to pay anything and that’s a big deal for a startup that cannot predict exactly what the right steps are to take months in advance. Flexibility is great for startups, because it’s hard to predict what type of work you’ll need done the next week. When you work with virtual teams, you can assign five hours of marketing tasks one week and 40 hours the next with no issue. As long as you have your freelancers on hand, your team will be ready for whatever you throw at them (or don’t). Not having full time employees allows us to “dial up and dial down” as we need. With remote workers, you don’t have to pay a consistent dollar amount every month that your business is stuck with. This enables you to focus where you need to in order to grow your business; if you want to focus more on marketing and less on development one week, you are free to do so. You won’t feel pressured to think up programming work for your developers to do since you’re paying their salary with or without work delivered. We like our freedom. We chose the remote work model because we enjoy it. It’s a lifestyle business choice that allows us to work when and how we want. It gives us the freedom to work when we’re in our element, on our own schedule and when we are most productive. Hiring remote contractors is relatively simple compared to hiring an employee and bringing them on board in an office. When you’re hiring an employee for a big company, you may have to go through rounds of interviews, do an in-person interview, show him or her around the office, deal with tax requirements and more just to get one person on payroll. With virtual teams, the company doesn’t have to do any of that. Since there is a lower commitment when hiring, it makes it easier to let go of mediocre employees and hire better performers instead. In our model when it’s time to fill a position, we typically start working with a few different people after short interviews. That experience of working with several people usually has a way of ensuring that you end up with the right person over time. The person you enjoy more and is producing better results simply gets more of the work, and the person getting less done gets less work. It’s actually pretty simple. We’re busy. We know what we know what tasks we need to get done, and our team knows what they need to get done. They’re well trained (a good walkthrough video can be even better than in person training because it lasts forever and can be given to multiple people). We also don’t have to deal with a commute, wasted time, or inefficient office space. Our startup doesn’t have to go through the stress of managing an office, bulk ordering paper and ink for the printers, and other mundane things that tend to get in the way of real work at an office. We get to spend more time with our families thanks to our remote work setup. 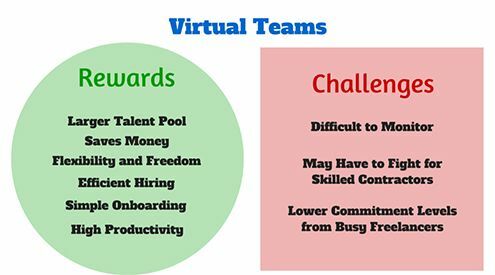 There are lots of benefits to virtual teams, but there are also some challenges. Read about how a few successful virtual companies around the world describe the pros and cons of remote employees at Virtual Companies: How and Why to Invest in Remote Teams. I’m going to tell you some stories of how we profited from using employee monitoring software. Thankfully, we have never had the misfortune of working with someone who stole $7,500 and wasted 2 months of our time, but there were some bumps in the road. Once upon a time we had a development team, and we found out that they were doing work for other clients while on the clock for us. This means that they would have billed us for their time while they did work for other clients. Without our screenshot software, we would have lost profit, wasted time and we would have been paying for a different company’s projects. Another example was that we discovered that one of the developers we contracted with wasn’t the sole developer working on our product. We realized that there were actually three different developers switching off on the work, which resulted in a drop in productivity and a really bad overall experience. Hubstaff’s activity levels let us know when something is wrong, so we can proactively address any issues before they become serious. The way these levels are calculated is based on keystrokes and mouse movements. That means if a remote employee normally has 80 percent activity levels and then suddenly drops to 40 percent, something is up. 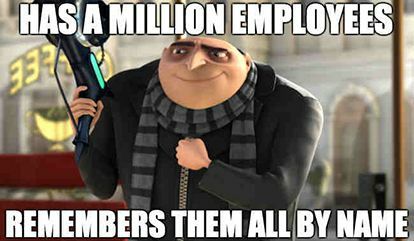 We can also tell when an employee is struggling. For example, if a developer is visiting URLs that are more educational (such as Stack Overflow), we know that this developer doesn’t have as much experience with the task we’ve asked for and may need more training. Our productivity and work monitoring software allows us to be confident that our team members are working for our company during the time they bill for. It gives us a sense of security and confidence that we are paying for work that is done for our startup, and that’s it. Sometimes it’s hard to get enough time from your team. It isn’t like an office setting where your team is there from 9 to 5 everyday. Some team members work for multiple clients, some just don’t want to work for more than a few hours a day, and it’s harder to get them to produce enough time for your startup. Virtual employees can be less committed to your business. Remote workers like to travel, they enjoy their own activities and sometimes you may find your employees “missing in action.” No one on our team is like that right now, but in the past I’ve experienced having a great discussion about moving forward with someone and then not hearing back for almost a week. In conclusion, we’re glad that we built our company remotely and looking back on it, we wouldn’t have done it any other way. From a professional standpoint it’s allowed our company to thrive. We’re bootstrapped so the fact is that we needed to get revenues built up before we could spend money on things like offices, full time employees, and gas for commutes. We just didn’t see the benefits to any of this. From a personal standpoint at the end of the day it’s really nice to just close the computer, walk out of my home office and be looking at my kids playing in the living room. Working without the stress of having to “lead” an office is the only way to go for me personally. It’s not for everyone, but for our team, it’s worked out awesome.